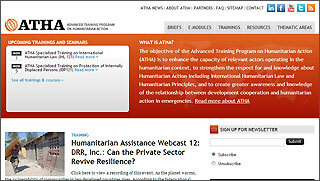 In this section you will find of courses and training opportunities on a variety of issues related to health and emergencies to go more in-depth on many of the topics presented in this Knowledge Center on Public Health and Disasters. Some of these training activities are self-study; others are offered by external agencies and institutions. Consult the links provided for additional information. This 2-week course aims to familiarize professionals with epidemiological techniques to determine impacts of disasters and conflicts and assess the needs of affected populations. 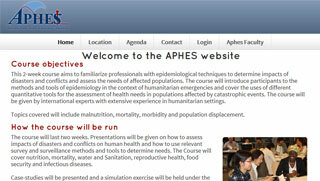 The course will introduce participants to the methods and tools of epidemiology in the context of humanitarian emergencies and cover the uses of different quantitative tools for the assessment of health needs in populations affected by catastrophic events. 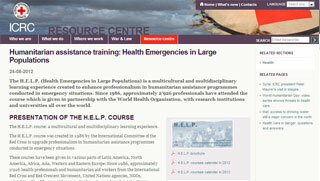 The HELP (Health Emergencies in Large Populations) is a multicultural and multidisciplinary learning experience created to enhance professionalism in humanitarian assistance programmes conducted in emergency situations. Since 1986, approximately 2,926 professionals have attended the course which is given in partnership with the World Health Organization, with research institutions and universities all over the world. Institution: International Committee of the Red Cross (ICRC). 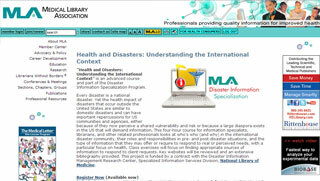 This four-hour course for information specialists, librarians, and other related professionals looks at who's who (and why) in the international disaster community, their roles and responsibilities in pre- and post-disaster situations, and the type of information that they may offer or require to respond to real or perceived needs, with a particular focus on health. 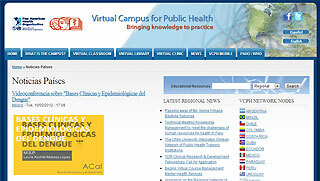 The Virtual Campus of Public Health is a network of people, institutions and organizations that share courses, resources, services and activities of education, information and knowledge management in training, with the common purpose of improving the skills of the workforce and practices of public health through the development and innovative use of information and communication technologies. 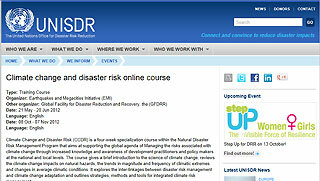 This is a four-week specialization course within the Natural Disaster Risk Management Program that aims at supporting the global agenda of Managing the risks associated with climate change through increased knowledge and awareness of development practitioners and policy makers at the national and local levels. It explores the inter-linkages between disaster risk management and climate change adaptation and outlines strategies, methods and tools for integrated climate risk management. This material can be used as for independent study, as a reference guide on the subject, and to provide participants at a workshop training event on the topic. The modules are based on a “multi-hazard” approach, and are typically applicable to preparedness in all of the hazard situations represented. However, the specific country context of the readers and trainees will necessitate a focus on the hazard types that are most applicable to their situation. 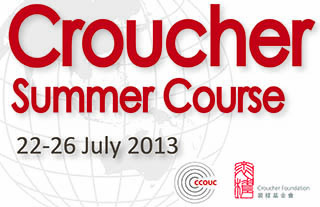 The objective of these courses is to enhance the capacity of relevant actors operating in the humanitarian context, to strengthen the respect for and knowledge about Humanitarian Action including International Humanitarian Law and Humanitarian Principles, and to create greater awareness and knowledge of the relationship between development cooperation and humanitarian action in emergencies . This course has been designed for professionals in client countries, World Bank and partner agencies involved in post-disaster assessments. 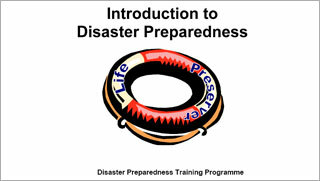 The course objective is to create a critical mass of professionals capable of conducting Damage, Loss and Needs Assessment (DaLA) following a major disaster. The training course exposes participants to the conceptual framework as well as practical applications of the DaLA methodology. 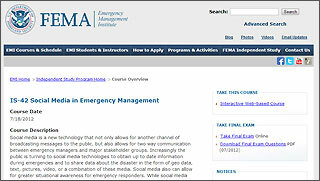 The purpose of this course is to provide the participants with best practices including tools, techniques and a basic roadmap to build capabilities in the use of social media technologies in their own emergency management organizations (State, local, Tribal) in order to further their emergency response missions. 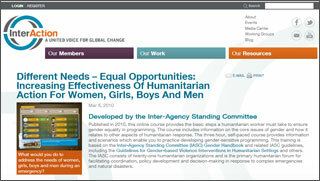 This online course provides the basic steps a humanitarian worker must take to ensure gender equality in programming. The course includes information on the core issues of gender and how it relates to other aspects of humanitarian response. The three hour, self-paced course provides information and scenarios which enable you to practice developing gender-sensitive programming. This course targets the technical cadre of Ministries of Health, mid- level policy makers, World Bank staff, development agency and donor agency staff, and other agents of change for better health outcomes. This course will teach the student how to survive when everything that is normally taken for granted is gone, when the structures we depend on have failed. 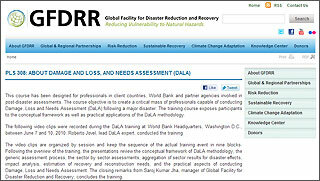 It examines the Disaster Cycle, particularly the Mitigation and Recovery phases. Students will prepare an extensive personal preparedness plan covering such topics as supplies, communication, food and water, shelter, security, and comfort (yes even in survival there can and should be comfort). It also looks at preparedness on the institutional and government levels. The course will introduce participants to the technical training in methods and tools to conduct research and design evidence-based intervention to address medical needs in the context of humanitarian emergencies. 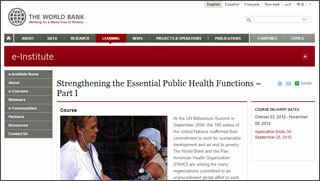 The public health training covers various quantitative and qualitative tools and techniques for health risk assessment, disaster epidemiology as well as medical programme planning and impact evaluation for populations affected by catastrophic events. 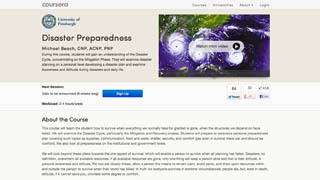 The ERR is a four-week online specialization course under the NDRMP, designed to link the science and engineering of earthquakes to structural and non-structural risk reduction practices. The course introduces the basic approaches to earthquake risk reduction, discussing the effectiveness of each in various regions of the world. 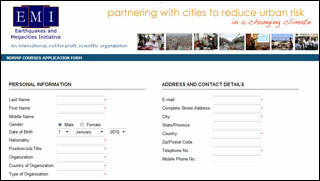 It provides essential information on earthquakes including the fundamental as well as proximate causes of earthquakes. It presents a step-by-step guide to developing an earthquake risk reduction program, as well as the four basic approaches to earthquake risk reduction.